How many measurements will he take? 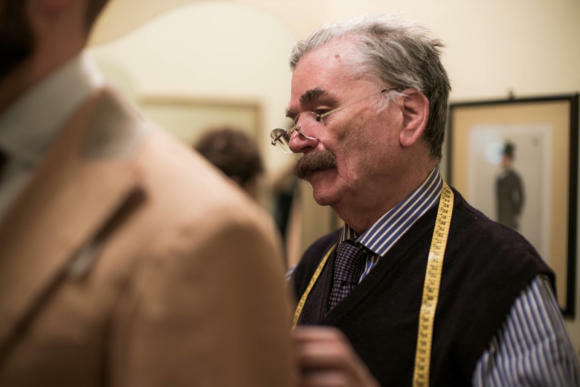 Getting a suit altered can be as good as made-to-measure. I was looking at several tailors that offer made-to-measure recently, where your suit is still made by machine, but uses specific measurements to create the template for that machine. It is incredibly unlikely that an off-the-peg suit will fit you perfectly, that your chest is bang on 40 inches, for example, and jacket and trouser waist fit the corresponding drop (the chest to trouser-waist difference, usually six inches on modern suits). So tailoring or made-to-measure are the only options if the suit is going to fit well. But watch the number of measurements the tailor says he will take. If it is only seven or eight then there will be no difference between that and a tailored ready-to-wear suit – as you can easily have these seven or eight changes made yourself. When I asked the tailors how many measurements they took, it varied from eight to fourteen. And I decided that one ready-to-wear suit only needed a few adjustments. I opted for an off-the-peg suit at Ralph Lauren with the trouser length, sleeve length and jacket waist adjusted. The adjustments are done at cost – £12 each. You can follow the discussion on How many measurements will he take? by entering your email address in the box below. You will then receive an email every time a new comment is added. These will also contain a link to a page where you can stop the alerts, and remove all of your related data from the site. I like the idea behind your blog and the way you’re executing it. I wanted to contact you but couldn’t find your contact information. Please leave me your email address at info@mensflair.com. A bespoke is bespoke, an RTW is for people who can’t afford philosophical better. You actually need only a few main measurements for cutting. With a proportional figure you can go to Wal-Mart and buy your suit. For me I take your measurements and cut your coat 0.5cm around your body. You probably don’t know that even the so called proportional sizes are not proportional, but the single measurements are proportional to each other. The point is you don’t have a clue about cutting, you don’t know that there are not many measurements necessary. You can take lots of control measurements as a tailor but still you only need a few important ones.